After almost a year from their debut, Lazy Late Kids are back with a new EP titled FRANCIS AND FRIENDS. Coming from the fourth chapter of the Some Tunes compilation series, "Francis" has been remixed by four label's mates: Bronstibok, helped by Mc Complex, created a dance grinding track with catchy vocals, Aerotronic opted for stop and go formula with lfo filters on the wild, Klipar focused on a dubstep/pistolpop approach and Jey Key for sudden stops with reverbs, long pauses and exaltation of the key melodies. The release doesn't have only remixes, you can find also two original instrumental tunes: "Revenge" sounds as Lazy Late Kids were remixing themselves, because it recalls a bit the structure of "Francis", "Crusader", instead, has classic grinding bass lines along with cinematic strings/cembalo section and it sounds like a distorted dance version of a Morricone track. Hellectro is always same-sounding, repetitive, monotonous and at least boring. Really? Come on, guys, and give this new talent hailing out of Belarus a fair chance. They of course do not re-invent the wheel of a car, but what they do here, sounds harsh, with passion and dedicated to the subject. 4 original tracks are featured here, plus 6 remix works by projects out of the Russian Harsh Electro/Industrial underground-scene with names like ZWEIFELHAFT, [DE:SOURCE], PSYQ, DIRTY BIRD 13, NANOBIOTICS, or that pure cover version on the title track by UNGRACE, which adds a rocking Crossover-feeling to the hard, straight-forward produced music. What counts is the sound, the energy and the sweat spent into the production of their own compositions and DIVERSANT: 13 are acting like a hurricane, which blows away the mediocrity out of too many artists in this genre. 'C*NT (feat. Miss13)' is a linear EBM-tune, which offers a bizarre sound vocal performance by the female guest vocalist Miss13. The track 'Electroscum, Inc.' additionally comes out raw, with some raging guitar riffs, and can be counted as being the most forward-moving tunes. The bass lines and the straight beat-work of this quartet are sweaty and breathtaking, while the difference to some central-European substitutes lays in the language, and a bit in the kind, how they perform their abrasive vocals. Thematically surprisingly not reflecting the deeds of the next mass-murderer, this quartet offers a nasty essay about the typical scene-affectation by its patronages ' although I don't speak Russian/Belarusian languages. 'Glamour And Pathos' is a promising first release for them, and they should be able to continue in this style. Thrilling enough produced to kick multiple, better-known projects out of the stadium, keep on rawking! 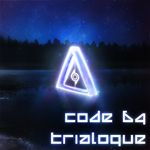 After their well recognized appetizer 'Stasis', released earlier this year as being a 5-track download-EP, the new formatted trio of CODE 64 offers a new and long awaited studio-album. As expected, this album follows the mood and impression already discovered from the 'Stasis'-EP, while it has some additional outstanding tunes to consume. Telling the listeners some tiny and charming sci-fi related stories of the how to leave our home world and to settle down in indescribable different worlds, CODE 64 offer a skilful and very modern form of Synth-/Futurepop-music, which is able to rival with the biggest names out of this music genre. Highly polished synth arrangements, diverse and intelligent chosen sound programs, and the crystal-clear performance by the new vocalist Hendrik Piehl - these all are ingredients featured here to cook a delicious ear-dinner. 'Stasis' is one hit, but 'Deviant', 'Higher Ground', or the fantastically arranged 'S.O.L.' can easily follow and should be ideal tracks, to safe any Synthpop-party. Highlight is nevertheless the sentimental ballad-like tune 'Oblivion', which slows down the rushing action and spends a spectacular, nearly chill-out like atmosphere with perfect synthesizer drops and a catchy vocal performance. Although that this album looses a bit of intensity after the 8th track, and yes, I don't think, that the half-baked tune 'Masquerade' isn't an ideal Single-follower to 'Stasis', the first half of this album I tend to call as being one of the most impressive Synth-/Futurepop-albums ever released. CODE 64 has had a good name in the past, but it won't wonder too much, if they will be able to enhance their international reputation. The band can already report about Chart-entries in Sweden's official album-charts. The talent is featured in this new band formation, so don't miss this album! A new EP from Germany's TO AVOID, how long we had to wait for this? After their last full-length album 'Voyage Into The Past' (Dark Wings/SPV) it has taken finally 4 years, until they decided to continue their musically path. Responsible for all musically decisions are GrandT and Marc as expected, while they get still backed up by their management tamb Media. Tamb Media has grown out of their small, but hard working agency Promo-Select, although there are still the same managing protagonists (Jean and the 'Cheffe' Marco Behrens) available. TO AVOID generally continue with their music style, which balances the possibilities between old-school EBM and Dark Electro music. This EP doesn't offer too much drastically changes, there can be simply noted some minor things like a better production. At least this doesn't wonder too much, because this EP acts rather like a collection of the things, which have been started during the last years, while it is quite recognizable, that there hasn't been too much activity as being a producing Electro/Industrial project. Asides the instrumental intro tune 'G.E.T. (German Electronic Terrorists)', there are only 3 really new compositions available, the title-track, 'Lying Eyes', and 'Against The Current', while you won't find an own original version of the last mentioned. The additional tracks 'War Nurse', and 'Do You Know' they have played during their live performances and both got produced for the first time as studio versions upon fan request. Finally there is available a remake 2009-version of their track 'Instrument Of The Death', taken originally from their last album mentioned above. 5 remixes offered by close friendly artists like AMNISTIA (excellent bass line programming on 'Passion And Pain'), NECRO FACILTY, CEPHALGY ('¦ a bit too Hellectro-related arranged to me'¦ intentional? ), SECOND DISEASE (how often do they produce remixes'¦?) and STIN SCATZOR are rather well-chosen names, which offer quality re-interpretations. It's good to see bands, which do not have any interest ('¦ and a coin-filled wallet'¦) to search for the global scene-player offering a bland and uninspired work. Let's keep the fingers crossed, that TO AVOID will be able to unite for more activities like gigs and a coming new full-length release, which hopefully continues to follow the unwritten law '100 % Terrorbanana-free'. I already talked about Robert Schroeder's music a couple of years ago, when I reviewed his Food For Fantasy latest release. Then I didn't know how much faceted his music could be and honestly I was curious to check his purest electronic music vein he was famous for (there was a reason why Klaus Schulze decided to promote him after discovering him). With his newest album CREAM, Robert Schroeder is back to his roots ideally linking this album to his 1979 debut ""Harmonic ascendant" thanks to six long tracks of analog electronic music (the shorter one is 8 minutes long while the longest one, the double). The album opens with "Magnetics", a tune based on a funky bass line with spacey pads perfect to start the voyage. "Groove electronically" sees Robert delivering a piano sonata enriched by vocal samples, choirs and lovely analog pads. LIttle by little this track grows thanks to upbeat drum rhythms and various synth arpeggios. "The zong" starts being menacing and experimental just to turn into a samba tune for aliens. "Funky spacetrip" sounds like an house mid tempo written in the 70s with cool vocoder filtered vocals and moog like solos. "Foaming waves" is perfect for a soundtrack: try to imagine a desolated place where wind and sand corrode the lands. Based on a guitar arpeggio with the add of lovely synth effects and a light drum beat it grows slowly like a wave of lava. The closing "Simply cream" is a great 16 minutes classic electronic music tune with many synth layers, rhythm changes and warm atmospheres. Classic and also with modern intuitions, CREAM made me discover the classic Robert Schroeder's and I'm glad it did!